This summer I researched drug resistance to first line treatments and the access (or lack thereof) to patent protected treatment in Uganda. I had originally planned on looking into initiatives being taken to deal with drug resistance and the distributions of ARVs in Uganda. However, on reaching Kampala, Uganda, and after reading literature and talking to various health professionals, I changed my topic and started to focus on the issues surrounding treatment failure and the decision making process of when to switch a patient from 1st to 2nd line ARV treatment. The Ugandan government provides first line treatment free to citizens with HIV; second line treatment, reserved for when first line treatment ceases to work, must be paid for by the patient. Different treatment centers relied on varying thresholds of measurement and definitions of treatment failure. In the resource-poor setting of the Uganda health services, limited switching options and issues of cost effectiveness also came into play. In Kampala I talked to different organizations including churches, organized AIDS programs, some government owned treatment centers, hospitals, and NGOs. I interviewed varying health professionals ranging from nurses and treatment dispensers to administrators. These interviews gave me an understanding of the complicated decision making process for treatment switching, a negotiation between doctors, patients, testing technology, and systemic lack of access to expensive drugs. From the different answers from different centers, the question of effectiveness/success of the Ugandan ART in absence of efficient monitoring strategies is raised. Uganda has very few medical devices which can measure viral load; viral load measurement is the best quantitative indicator for when patients’ ARV therapy is becoming ineffective, and when they need to switch to a second line. In the absence of this expensive monitoring technology doctors and health officials use informal diagnoses to understand when their patients must switch therapy. Sometimes this means that the patient switches too late, and the second line therapy is therefore ineffective. This intersection of medicine and scarcity raises many questions. How best can this success be monitored? If patients are switched too late how will this affect the clinical success of 2nd line? Is a set of national guidelines and thresholds needed for health professionals to follow in order to have early detections? If so, how will the thresholds be determined, given the limited switching options available in resource limited settings? Given that a lot of these issues come up as a result of lack of switching options, the question lingers about whether it should be acceptable that resource limited settings should settle for just 2 regimens yet there exist 3rd and 4th line regimens in the Western world that have just been made available/accessible to this side of the world. As more and more countries make ARVs available to their citizens, Uganda provides a critical case study in what comes next – these life-saving drugs, by themselves, are simply not enough. Over this past summer I conducted fieldwork in Rio de Janeiro, working in Brazil’s only health technology assessment company. Brazil’s Ministry of Health has been instituting a set of policies over the past two years that seek to ensure that the integration of new medications into the country’s public health system is based upon economic analyses, such as cost-effectiveness. Such analyses seem like attractive decision-making tools for countries facing out-of-control health costs. However, data used for such analyses are frequently incomplete, local contexts where resources are to be applied may be poorly understood, and there are a number of factors, such the agency of physicians, for which it is difficult to account. Nevertheless, such analyses are playing an important role in determining which medications the general population will be able to access through Brazil’s public healthcare system. In a coming paper, I will elaborate on the particular challenges and possibilities of using such analyses in resource-poor settings, drawing on Brazil’s experience. I will then relate Brazil’s challenges with the precedents set by established systems for health technology assessment and integration in countries such as England and Australia that serve as international standards. After working in this health technology assessment company, I accompanied Professor Biehl to southern Brazil. Following conceptual and strategic precedents set by AIDS activists, scores of patients are suing the government to force it to pay for their medications. They base their claims on the Brazilian constitutional right to health, which they articulate as a right to access to pharmaceutical products. The court cases are straining state budgets, disrupting established drug distribution schemes, and raising challenging questions about the right to health. We are setting up a database to collect information on these cases in southern Brazil, while we engage in a long-term ethnographic project carrying out interviews with members of the judiciary, NGOs and healthcare providers. Some questions to be considered are: how is the right to health being understood and constructed? What are appropriates standards of care in resource-poor settings, who is responsible for setting them and how? What sort of knowledge is necessary to justify high-cost medical treatments in resource-poor settings and who is responsible for generating and evaluating it? I had no idea what to expect as I strolled into the Rixile HIV clinic at Tintswalo Hospital in the rural town of Bushbuckridge, South Africa. I certainly didn’t expect an African clinic with 6,000 patients to be run by a scrawny, Scottish doctor in his late twenties. 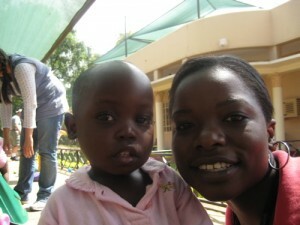 On my first day, I saw more infectious disease than many will see in a lifetime. But just as ubiquitous as the patient’s suffering was the doctor’s constant struggle to provide adequate care. When a doctor had to redo a blood test after the lab lost the previous sample, I was shocked to learn that this was a common occurrence. One mother died in childbirth when a simple blood transfusion would have saved her. The hospital wasn’t out of blood; the nurses simply couldn’t find it. A year after the government purchased the antiretroviral Tenofovir for its treatment regimen, it summarily pulled the plug and failed to issue a plausible explanation. The Scottish doctor told me once that most of his job was spent trying to diagnose TB. The PPD test is useless in immuno-suppressed HIV patients, growing a TB culture takes 40-50 days, the one x-ray machine is constantly broken, and it is nearly impossible to get patients to produce adequate sputum samples. But amazingly, the doctors persevered. They would all meet for tea in the morning and discuss difficult cases. X-rays and blood vials made frequent guest appearances. Each day, the HIV clinic doctor squeezed in extra time between his patients to consult on patients in other wards. But most importantly, he treated all of his patients with complete respect, even a traditional healer who was convinced that a rival clan had poisoned her food with HIV. If patients were doing well on treatment, he would down-refer them to local community clinics, for he rightly conceived HIV as a manageable, chronic illness that can be treated on the primary care level. He even helped people secure their disability grants, which was often the biggest concern of many of his patients. Successful treatment regimes were ensured be a variety of social and psychological requirements that complimented the science of treatment. Before starting treatment, each patient had to demonstrate psycho-social preparedness. This included having a “treatment supporter” that could pick up the ARV mediation if the patient were incapacitated and disclosing to one’s partner or family. Each patient also had to attend classes about the ARV drugs and the importance of 100% adherence and meet with a dietician and social worker. This model where laypeople are supporting the scientific community in delivering treatment is the emerging model for successful treatment programs in Africa, and it should undoubtedly be extended elsewhere. After my time in the clinic, I spent a month at an economic policy research institute, where I looked into the nature of South Africa’s social welfare system and its effect on HIV patients. I discovered the integral role of the disability grant in the health care system, where patients relied on the grant to finance food and transportation expenses. Unfortunately, HIV patients who begin the ARV treatment regime are losing their grants as their health gets restored by the drugs. Stripping patients of their grant after several months of successful treatment, however, is a paradox of the worst kind. It ignores that patients will still need the same food and transportation security to continue their treatment, which for HIV and other chronic illnesses, is a life-long commitment. With regards to HIV treatment, nutrition is especially essential because malnutrition exacerbates the immune-suppression triggered by HIV. Nutritional deprivation also worsens treatment side effects, which are a main cause of poor adherence. Transportation is equally important for adherence since most patients must travel considerable distances to collect their medication from the hospital. Without drug adherence, drug resistance is inevitable, a phenomenon that will only magnify the HIV epidemic. Since disability grants are not permanent by nature, and since relaxing the eligibility requirements would encourage fraud and distort the labor market, I found that many experts considered it most prudent to address these issues with a basic social grant. A social grant targeted only for those people with HIV would obviously be a stigmatizing nightmare, so the most appropriate solution is a universal, basic income grant. My research shows the complex, subtle links between HIV policy and social policy. As antiretroviral drugs become available in resource poor contexts in the global south, links between chronic disease and poverty will become more and more important to policy makers and public health experts. Political and social policy in South Africa has a profound effect on health, not just in the context of funding for clinics, but in the more subtle world of patients struggling to meet their basic needs while caring for their HIV status. This past summer conducted a study in Puebla, Mexico on how the therapeutic itineraries of HIV/AIDS patients affect their lives. I conducted open-ended interviews with HIV infected patients, helped patients fill out questionnaires about adherence to medication, collected data from patient charts and pharmacy records, and engaged in ethnographic fieldwork. My research allows for a consideration of how medical and local cultures affect patient and disease conceptions, access to information and the success of treatments. I found that even in the presence of a national health care plan which distributes free antiretroviral therapies, stigma remains a huge impediment to treatment and prevention efforts. The homophobia and machismo woven into the culture of Mexico hinder the control of HIV as they discourage sexual partners from using condoms. In Mexican culture, condoms suggest either infidelity, which is laudable among men but punishable among women, or HIV infection, which is associated with homosexuality. Either consequence shrouds prevention efforts in social silence. Furthermore, doctors assigned by the government to AIDS clinics saw the responsibility as an unwanted burden. One physician who underwent spinal surgery could not find a temporary replacement for her position. 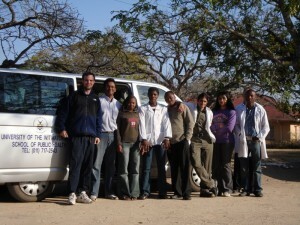 The physicians felt that they would not be hired elsewhere, as a result of the assumption that they were HIV positive. I found that every patient has a unique story of his/her diagnosis, disclosure, and adherence pattern, as well as a unique understanding of how HIV impacts his/her daily life and future goals. Pre-existing perceptions of what life with HIV is like, even among those infected with HIV, can influence patients’ life paths; therefore, the actual realities of those infected with HIV need to be understood. This means understanding of the intricacies of others’ lives (including diversities and vulnerabilities), and arguing against the oversimplification and generalization of a complex population. This summer I worked on a congenital syphilis elimination project in Ciudad Juarez, the sister city of El Paso. 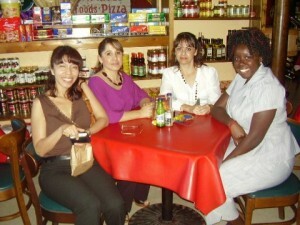 I did research as an intern with the Pan American Health Organization Field Office in El Paso. This summer my research centered on syphilis and understanding why it has remained a public health problem for countries all over the world, especially Latin American and Caribbean nations. Because of the instability and danger of Ciudad Juarez I did most of my research on policy and health statistics. My local advisors discouraged me from entering the city to conduct interviews. Fortunately, this lead me to uncover shocking statistical evidence about congenital syphilis, a disease that does not factor into new public health emphases on tropical disease and HIV/AIDS. In order to understand the specific dynamics of syphilis along the U.S.-Mexico border, I had to assess and analyze the problem throughout the region. Congenital syphilis occurs when a syphilis-infected mother gives birth, and has severe health consequences for the infant. Syphilis-associated stillbirths are rarely reported throughout the Latin American and Carribean Region, despite the fact that perinatal death is the result of nearly 40% of pregnancies among women who have untreated syphilis. Between 1987 and 1992, the incidence of congenital syphilis in the region ranged from 2.2 to over 250 per 100,000 live births. Among selected populations of pregnant women in a group of Latin American and Caribbean countries, over 90% of reported syphilis seroprevalence rates ranged between 1.7% and 7.4%. According to a study by the World Health Organization in 1999, Latin American and Caribbean countries account for twenty-five percent of the reported cases of syphilis in the world. The United States-México Border is the most porous border in the world, and as such the issues surrounding the spread of communicable diseases are also sizeable. Congenital syphilis is still a problem that both countries have yet to eradicate. Along the U.S. side of the border, the rates of congenital syphilis are higher than the national average. Of the states reporting data to the Center for Disease Control in 2006, the rate was 8.7 cases per 100,000 live births. The border states of Arizona, New Mexico, California and Texas all witnessed higher rates of 17.1, 24.7, 12.1, and 20.7 cases per 100,000 live births respectively. On the other side of the border, rates have also seen an increase. Between 2002 and 2004 an estimate of between 100 to 117 annual cases of congenital syphilis were reported in México. The state of Chihuahua reported 42.5% of all cases in the country during those three years; regions that border with the United States of America accounted for two-thirds of all of these cases. Moreover, a 2002 Mexican survey showed that syphilis in the general population was underreported by 84%. Effective treatment for syphilis has been available for more than a century, and is currently very inexpensive (simple penicillin is effective). Despite this the United States and Mexico have not eradicated the disease. This may be the result of many reasons: widespread under registry of syphilis in many parts of the world, societal ignorance to the severity of congenital and post-primary and secondary syphilis, and its weaker socially constructed definition as compared other STIs and communicable diseases. Biologically speaking, syphilis is simple. It’s caused by bacteria and cured by penicillin. Socially and culturally speaking syphilis is not so simple. It takes a back seat to other more culturally sensitive STIs and communicable disease, especially HIV/AIDs. As a result, syphilis is still a disease that has yet to be seriously addressed. Growing public health emphasis on malaria, TB and HIV has ignored this ancient, easily treatable disease. My research also exposes inadequacies in surveillance measures – since most congenital syphilis related stillbirths go unreported, it is difficult to gauge the severity of the disease, and consequently difficult to attract funding and attention. My project combines ethnographic and textual research on the newly created category of “neglected tropical diseases.” This new emphasis in health policy began to affect both Ghana and Belize very directly in 2006, when they each began to widely distribute pharmaceuticals as part of new National De-worming Campaigns. The comparative nature of my 2008 summer study was intended to emphasize the distinct social factors that come into play in the local reception of health policy, by tracking essentially parallel programs in the contexts of these two former British colonies. Yet as I tried to trace the implementation of this new pharmaceutical distribution program, which administers deworming antibiotics and vitamin A tablets to all school-aged children in certain regions of Belize and Ghana, the unexpected reality that I encountered when entering local homes and clinics time and again brought me back to the issue of diabetes. This reality leads to the question of how to categorize this non-communicable epidemic; since an epidemic is defined as “an outbreak of contagious disease,” the pairing of these two words itself presents a fundamental oxymoron. I hypothesize that this confused terminology in fact represents a novel category of disease emerging between infectious and non-communicable disease as they are traditionally inscribed by biomedicine. By theorizing and ethnographically exploring the concept of para-communicable disease as a third category, I anticipate that this research will contribute conceptually as well as methodologically to the work of illuminating emerging patterns of disease as the corollary of novel social forms. My current dissertation research has evolved into a comparative study of these two chronic, nutritionally-related diseases, one contagious (parasitic infection) and the other non-communicable (diabetes). By tracing and contrasting the available care systems for each of these conditions, I hope to illuminate the national and global problem of integrating care for non-communicable afflictions into contagion- and technology-oriented health campaigns. How do international funding and global media attention play a role in shaping programs and the treatment resources available to community doctors and local families, or inflect their experiences of disease? My project explores the way that local perceptions of technology and medical need can dramatically affect the ways health programs are received–with the ultimate aim of illuminating both the intricacies of intercultural relations, and the life-shaping ways this knowledge might one day inform more culturally nuanced health policies. Center for the Study of the Presidency, Washington, D.C.
Over the summer, I worked with the Health and Medicine team at the Center for the Study of the Presidency, an advocacy organization in the lobbying corridor of Washington. With the conclusions from our discussions in April and May in mind, I set out to better understand the politics behind HIV/AIDS. Throughout my time in DC, I published an op-ed on the state of virus in the District, investigated the promises of “health diplomacy,” compared Presidential hopefuls’ healthcare plans, and, finally, wrote a brief on the issues of global tobacco use. The most meaningful of these experiences to me was writing the op-ed. After seeing an AIDS public service announcement in a Metro car, I was surprised to discover that 1 in 20 adults in Washington are currently living with HIV. Through my research for the article, I was able to offer some policy suggestions and issue a call to action with a particular emphasis on testing. In the United States, a quarter of the million Americans infected with HIV are unaware of their status. But beyond what I achieved in examining specific HIV policies in Washington, perhaps more importantly, I was able to gain insight into more general global health problems. One of the lessons I took home, for example, was the necessity of reaching a balance between statistics and ethnography. In some settings, lobbyists and advocates would insist on using data and facts, but in others, these same people drew more upon anecdotal evidence than anything else. These realizations, I feel, will continue to reappear and will play a significant role in guiding me through my independent work over the next two years. I spent the summer in Mongolia with the One Laptop per Child Program. One Laptop per Child provides low-cost, durable laptop computers to children for education. 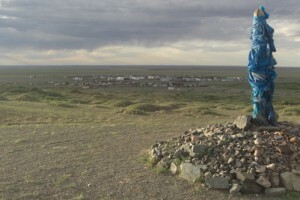 Sonia worked with educators and government officials in Mongolia, visiting several schools and conducting training sessions for children and teachers. My research showed the challenges that development programs like One Laptop per Child face. The laptop distribution required significant financial and time commitment from government agencies; ultimately, Mongolian Ministry of Education officials were not able to mobilize promised resources and the program had only limited success. My research shows the complex reality of a product donation, a situation in which local actors may wish to exploit international philanthropy for their own political ends, and in which project administrators may be powerless to implement their programs. My internship this summer gave me a glimpse into the internal workings of a Mexican non-profit public health organization: the challenges faced, the approach towards addressing issues of public health, and the methodology used by the organization. I spent two and a half months working on the third floor of a small office of about thirty people located in a business district of Mexico City. This office constituted the head-quarters of the Instituto Mexicano de Investigación Familiar y Población (Mexican Institute of Family and Population Research, or IMIFAP), a non-governmental organization founded in the 1980s to address the critical need for sexual health education in Mexico’s public school curriculum. After its founding, IMIFAP grew to create education programs to encompass a wider range of issues, as the programmers encountered problems of public health that they saw as interconnected issues. Today, IMIFAP has programs in rural and urban communities across Mexico that deal with issues such as HIV/AIDS, diabetes, nutrition, and, more recently, microfinance and capacity building. The basic framework of IMIFAP’s programming is structured in its pyramid style of knowledge dissemination and its curriculum emphasizing general skills associated with personal agency, called “life skills.” Each program has a number of IMIFAP-hired facilitators who work on the field and occasionally in the office. These facilitators lead workshops to chosen members of the target community who then similarly set up their own workshops for the greater population in order to teach the curriculum. 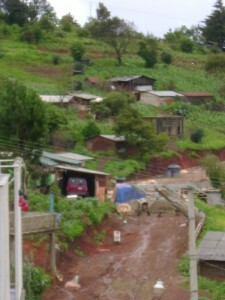 This set-up is particularly useful for sustaining the projects and for communicating with small indigenous populations that speak different languages. During my stay in Mexico, I was able to travel with two IMIFAP facilitators to San Martín, a small town in the southern state of Oaxaca, to watch a microfinance and health program unfold in its early stages of planning. 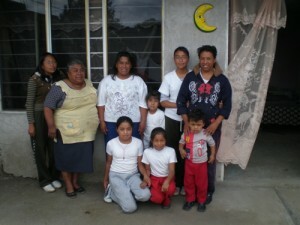 The two facilitators went to ask formal permission of one of the town’s principal leaders to start training bilingual women in the community in a program that would empower women, teach them about hygiene and nutrition, and create skills to help with small businesses producing textiles (nearly all the women in San Martín dress in beautiful red cloaks woven by the women of the community). We also met with the school principal, who told us that the greatest health problem for children at the town’s school was hunger and malnutrition- without a lunch, many were unable to focus through class. IMIFAP’s programming in this small town aimed to address two critical problems of the community: gender inequality and severe poverty. My office work at IMIFAP revolved around the book to be published by IMIFAP’s director about the organization’s programs and the theoretical frameworks for personal agency, sustainability, and empowerment. My research and editing work on the book highlighted for me the approach of the organization towards issues of health and the language that its methodology involved. As an organization founded by an academic psychologist, IMIFAP’s language and methodology is based largely on behavioral change and promoting personal agency. The book contains many buzz words, such as “life skills,” “capability approach,” and “agentic empowerment.” This behavioral approach to programming often seems to leave significant gaps in loci of concrete change. For example, while the microfinance programs do train participants in skills of agency to lead successful businesses, they do not provide calculators or teach participants how to determine an interest rate. My work for IMIFAP led me to believe that the greatest change in Mexico’s struggling communities could be accomplished by a combination of IMIFAP’s sustainable pyramid structure and more specific approaches that focus on concrete skills and tools for community members.